When I haven't been blogging, editing, teaching, or seeing patients this summer, I have experienced the satisfaction of having reports of a couple of my longer-term projects appear in medical journals. In contrast to a blog post, which can be conceived, written, and published in a few hours (although the thought process often takes much longer), the timeline from submission to publication in a journal is usually several months at a minimum. We found that a majority of primary care–relevant Choosing Wisely recommendations are based on expert consensus or disease-oriented evidence. In light of other factors that drive unnecessary medical interventions, such as patient satisfaction and fee-for-service reimbursement, this may make it more difficult to convince clinicians to change established practices. Further research is warranted to strengthen the evidence base supporting these recommendations in order to improve their acceptance and implementation into primary care. Although students and novice writers may want to purchase a more traditional and/or less expensive book on the craft, I recommend What Every Medical Writer Needs to Know as a valuable resource not only for “serious” medical authors who write for a living but for family physicians and clinicians who write occasionally for publication and would enjoy learning more about the inspiring history of the profession. After it was published, a residency mentor, whom I credit for giving me my start in medical writing, e-mailed me to say that he had decided to purchase a copy of the book based on my review! 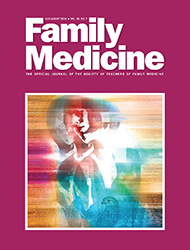 Although blogging has advantages over traditional medical publications (perhaps my favorite being that I get to be the writer and the editor), I am glad that I invested the time to be published in these family medicine journals.